The African Methodist Episcopal Church was born out of the desire of free black church-goers in Philadelphia to worship in an atmosphere devoid of racial discrimination. Early in the 19th century, Richard Allen, a former Delaware slave, successfully sued in the Pennsylvania courts for the right of his congregation to exist as an independent institution. 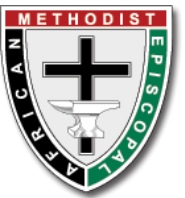 Other black Methodists throughout the mid-Atlantic joined with him to form a new denomination in the Wesley tradition. Learn more about the history, name, and beliefs of the AMEC at the denomination's website. Richard Allen, the first bishop of the African Methodist Episcopal Church, will be honored with a U.S. postage stamp commemorating his leadership of the historically black denomination founded 200 years ago. The new stamp will be featured in a ceremony Tuesday (Feb. 2) at Mother Bethel African Methodist Episcopal Church in Philadelphia. It becomes the 39th stamp in the Black Heritage series after more than 40,000 people petitioned the postal service for its creation. The art for the stamp is a detail of Allen’s portrait from an 1876 print, “Bishops of the A.M.E. Church,” from the collection of the Library Company of Philadelphia. 1. He founded the AME Church after worship of blacks was restricted. Allen started Bethel AME Church after watching officials of St. George’s Methodist Episcopal Church pull up his friend, clergyman Absalom Jones, who was praying on his knees. “The unwillingness of the Methodists to accept the independent leadership of black preachers like Allen and the institution of segregated seating led Allen and Jones to found independent black churches,” said American religious historian Albert J. Raboteau. 2. He aided in the conversion of his slavemaster. Once converted himself, Allen played a role in the conversion of Stokeley Sturgis, a Delaware man who owned him. 3. He licensed a woman to preach. 4. He was a successful businessman. Allen worked throughout his ministry so he did not need to depend on his congregation for support. 5. He pioneered African-American-owned institutions. Before he started the AME Church, Allen was instrumental in founding the Free African Society, which helped newly freed blacks develop leadership skills. He also founded an organization that promoted the education of black schoolchildren.